Admission: I should be planning what I’m serving for Christmas dinner this year–or at least thinking about planning it–but I’m just not there yet. Part of it is sheer laziness and part of it is being stuck with the ghost of Christmas past. I keep thinking about last Christmas, and how I surprised Mama by ordering these ridiculously expensive (but adorable and delicious) mini-latkes via mail order and serving them topped with a dollop of creme fraiche, some excellent Scottish smoked salmon, slivers of red onion and a sprinkling of capers. This preparation was, by a long shot, Mama’s favorite way of eating latkes, and I’d have to agree. A topping of smoked salmon and creme fraiche blows plain old applesauce out of the water. We aren’t Jewish, but who cares? I’m not going to let a wee thing like religion come between my mouth and a latke. Something as heavenly as a fried potato pancake deserves devotion of all kinds. At the time, I suffered a little sticker shock at the expense (and yes, I could have made my own latkes but ahem…lazy) but looking back on it, I’m so glad I served them. They delighted her. And it delighted me that they delighted her. I don’t think I’ll be able to stomach serving them this year, even though last year, we decided that they’d become a new tradition. So I guess I’m in the market for a new appetizer for our holiday dinner–any thoughts or ideas, readers? Is there something you serve that’s irresistible or a beloved family favorite? One thing that’s sure to be on the table is Miss D.’s beloved Honeybaked Ham. She loves it too much to restrict it to Easter. The ham is her spirit animal, but I usually like to serve another main dish for some variety–in years past I’ve done pork roasts, tenderloin roasts, racks of lamb (Hella expensive but feels so festive), even full sides of salmon. Where I really seem to get stuck is on the side dishes. There’s usually potatoes in some form, because everyone loves a good potato dish, but I never feel very inspired by them, you know? And yeah, yeah a green vegetable of some sort…yawn. 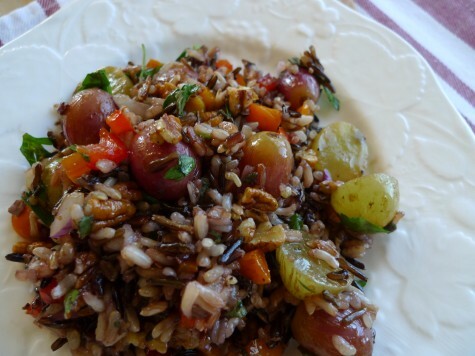 If you’re looking for a side dish that’s a little different this year, consider giving this wild rice dish a try. I saw this recipe a few months ago and bookmarked it because it seemed…well…weird. Who roasts grapes? How is that going to work with the balsamic vinegar? Is it sweet or savory? The answer to that last question is: a little of both. Roasting the grapes concentrates their sugars a bit, and the balsamic glaze is both sweet and tart–when you put them together, it’s really surprisingly good. 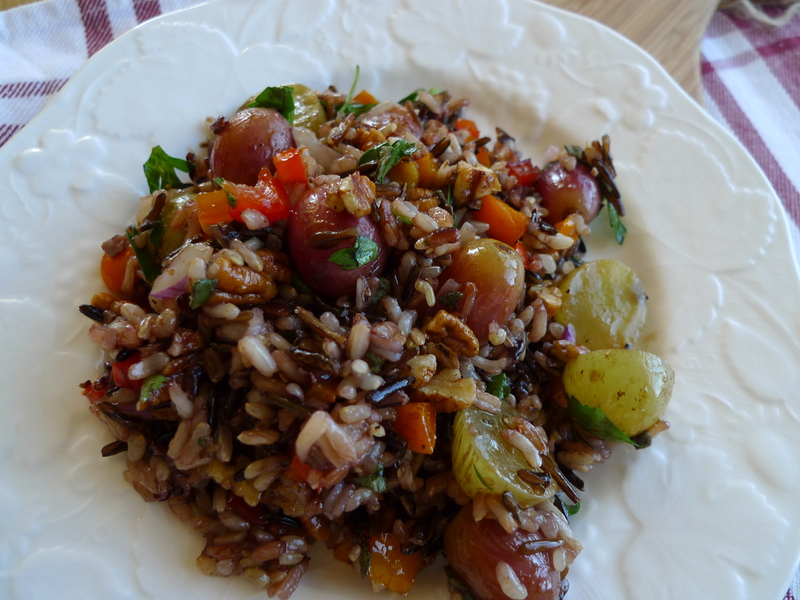 I love the heartiness of the wild rice, and the pecans add a lovely, meaty richness. I’m not a huge fan of sage, but I have to say, I thought it worked here. If you are truly anti-sage, I think fresh rosemary would be brilliant in this. I thought the contrast of flavors in this were kind of addictive. I ate it warm, at room temperature and even cold as leftovers and it was yummy no matter what. I think I liked this more than my husband, who thought it was a leeetle weird for his taste, but that just meant more for me. This dish is really pretty if you use both red and green grapes and it would look fabulous on your holiday buffet table. It’s particularly suited to poultry dishes, so if you’re one of those people who serves a holiday bird, definitely consider this. As the holidays grow nearer, I’ll keep you posted on menu progress…heck, maybe I’ll just throw all caution to the wind and serve a big pot of spaghetti and meatballs or a groaning pan of enchiladas. I have a feeling that this year, anything goes. I’m even baking dessert this year, which I never, ever do. Dessert is always my one purchased holiday item, usually specialty chocolates or a fancy tart, but this Christmas, my pie-loving husband has requested chocolate bourbon pecan pie. Yikes! Me + pastry usually = disaster, but I’m going to give it a shot. If it’s a bust, at least I’ll have a good story, right? But I am going to get some backup chocolates, just in case! Hope you all are looking forward to the holidays, and even if you’re struggling a little like I am, I hope you can find ways to get into the spirit and enjoy the comfort and love of your family and loved ones. Bring a quart of water to a boil in a 4-quart saucepan. Add rice and 1 teaspoon salt. Stir, cover pan and lower the heat to a simmer. Cook until rice is tender but the grains are not split open, about 45-55 minutes. If using a rice blend, follow package directions for cooking. Drain rice. 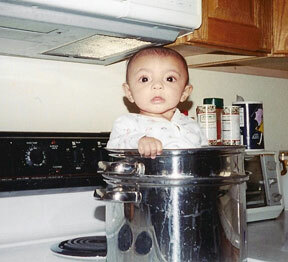 Meanwhile, position a rack in the center of the oven and preheat it to 350 degrees. Line an 8×8-inch baking dish with foil. 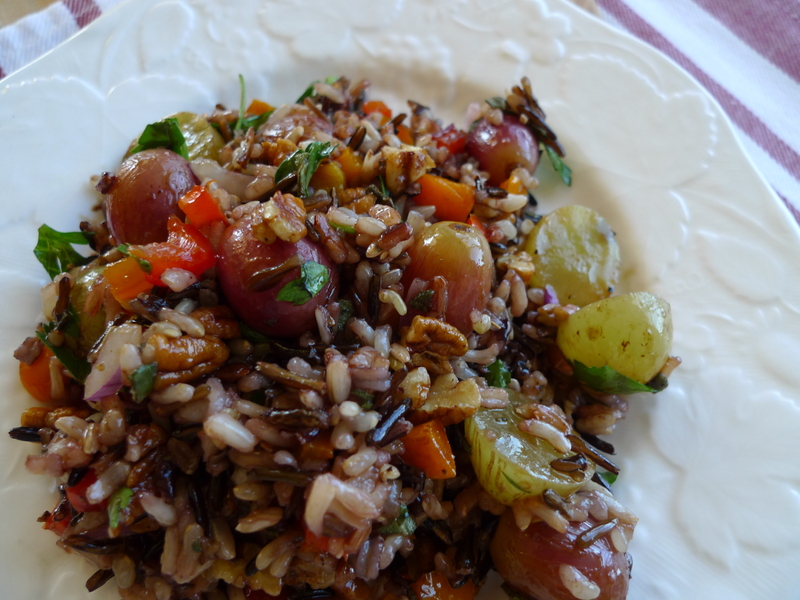 Toss grapes with the balsamic glaze and roast until grapes are soft but still hold their shape, about 15 minutes. Melt the butter in a saucepan over medium heat. Add the shallot and cook 3-5 minutes or until softened. Stir in the pecans and syrup and cook until syrup coats pecans, about 2 minutes. Remove from heat. Stir in the sage. Add the rice, grapes, lemon juice and pepper to the saucepan and stir to combine. Season to taste with salt and pepper. *If you can’t find balsamic glaze, you can make your own by boiling 1/4 of a cup of balsamic vinegar in a small saucepan until it’s reduced by half and syrupy. I’ve roasted grapes for a Brussels sprouts recipe before and they are interesting! The addition of balsamic vinegar definitely helps. You could do crab legs for Christmas dinner? Or a lobster pot pie? The crab legs are super easy and indulgent. Double win. While we SHOULD be thinking about what we want to make on Christmas since we’ll be at my in-laws and therefore in charge of the kitchen, instead I spent part of Sunday afternoon communing with my cookbooks and flagging a ton of ideas for our NYE party instead. (In all fairness, it requires way more planning anyway, so it’s good to get it out of the way.) For side dishes I’m a fan of ricotta dumplings–simpler than gnudi but still chock full of cheesy carbs and herbs (never a bad thing) and they go nicely on a bed of lightly dressed arugula too to get some greenery. Looks like I’ll have to go through my cookbooks again this Sunday to get some more inspiration! Dana, I am with Miss D on the Honeybaked ham! So worth it! But I don’t think they have their booth at King Soopers any more. Do we have to drive to Westminster to get it now?? :( :( Ain’t got time for that! Silver Creek H.S. is wrapping presents as a fundraiser — I saw a meme on Fb but didn’t get the date. I was going to leave one other comment, but I forget what it was. Gah! Middle aged brain! Thinking of you over the holidays as you miss your Mama. What a treasure she was! She would be so proud of you and the way you are holding your head up and going forward, making the holidays special for your family.